3.9 out of 5 based on 63 bloggers and 18 commenters. 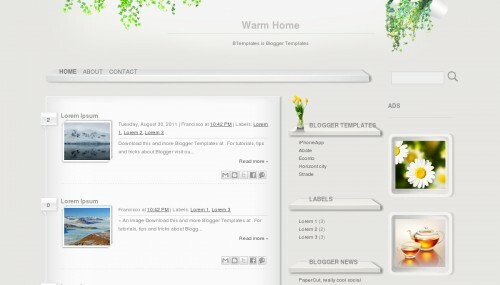 Warm Home is a free blogger template adapted from WordPress with 3 columns, right sidebar, ads ready, posts thumbnails, floral motifs and gradients. Excellent template for blogs about family, health and beauty, home and decoration or nature. This a cool and clear template. I like all simple designs. Sou uma pessoa que adora mudar o lasyout,assim como as postagens,pois manter sempre o mersmo plano de fundome cansa. Gostei tanto que mudei o layout hoje para este..Amei!!!! I am redoing my blog, and this is perfect! Thank you! There is a glitch somewhere in the left sidebar. Evidently, the script for the pictures is messing up the ability to arrange the gadgets, because they appear very small and arrange themselves horizontally, making them hard to rearrange. Achei melhor colocar o texto todo na postagem, pois noto que os visitantes preferem encontrar todo o texto, do que apenas o início e foi o que fiz,inclusive o layout fica mais bonito…Achei que ficou melhor para o meu gosto, mas não mudei a estrutura do blog.Gostaria de saber se posso mantêe-lo assim…. mas gosstaria de saber pq nao aparece as fotos do girassol e do oleo? I enjoyed a lot this template as well. I would like to know why in my template there is no pictures in the right side as above? is great i want to try this template… i like it, is good. I like this template so much, but why I don’t have those lovely pictures on the right side? If it isn’t in this design, would you mind telling me where I can find them? These pictures are really great and a big part of the template’s charm. however, how do I activate the post thumbnails? Currently they’re all a grey flower, which I would like to change. Is this possible? Thank you for making this available. It’s really a pretty blogger background, but I’m going to have to look for another. It puts the labels of a post above the post and I would rather they be put after the post. It puts a page break in the middle of a post when I don’t want it there and cannot remove it. It is very hard to work with and to edit. It’s beautiful, but it just won’t work for me. Thank you! nao consigo abaixar a pagina no meu blog fala em fechar XML como eu faco alguem pode me ajudar? Perfect for my blog, I’m renovating it and this theme is very ‘user-friendly’! I love it!